A couple of weeks ago, I was asked to present a program on LongArm rulers and templates to a local HandiQuilter Guild. I had a great day sharing my ideas and techniques with some wonderful quilters. Each of the ladies brought me a donation of fabric to use for Quilts of Valor. Some of the fabric went to Kevin The Quilter to use for backings for the block drive quilts. The rest I used to piece this top. Unfortunately I ran out of time to quilt it, but fortunately, my local QofV group, "Eastern Missouri Quilts of Valor" are hand quilters! So they will receive the top for quilting. I started with the panel I received and 3 coordinating fabrics. There were 15 squares in the panel and I needed 20 to get the size required, minimum 60x70. So off to one of my favorite quilt shops Osewpersonal in O'Fallon Missouri to buy another panel! 7 1/2" x 7 1/2". Next I cut my strips at 2 1/2". This makes it easy to figure strip lengths or to use a Jelly Roll. Cut 20 pieces for each size listed below. I cut my largest lengths first, I find it waste less fabric. Here's my strips all laid out and ready to chain piece. Piecing is just like a half log cabin, Piece the white and red sides first. Add the blue strips last. A better picture of just the top half. It's now ready to give to the Eastern Missouri Quilts of Valor quilters to hand quilt, then off to a deserving Veteran! JaNeanne, I'm glad you liked this. 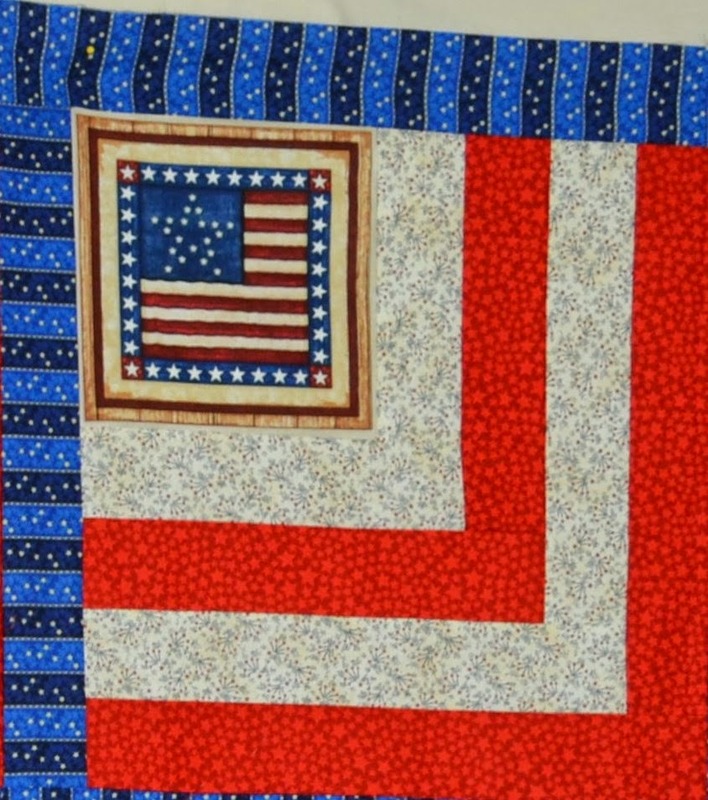 I hope to publish some more easy Patterns on my blog for Quilts of Valor type quilts. Very nice QoV Ann. Thanks for making and donating to our group. Dar.. I really enjoy coming to this group and hope to come often.